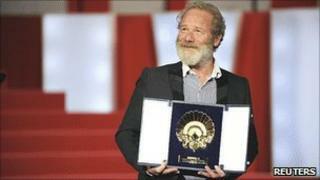 Director Peter Mullan's film Neds, a coming of age drama set in 1970s Glasgow, has taken two top honours at the San Sebastian Film Festival. Neds - short for non-educated delinquents - follows an intelligent boy struggling with gang warfare, an alcoholic father and class barriers. Mullan, who also wrote the script and acts in the film, has described it as "personal but not autobiographical". It picked up the best film award, while Conor McCarron was named best actor. The Scottish newcomer has won glowing reviews for his performance as troubled teenager John McGill. The film received its world premiere at the Toronto Film Festival earlier this month, where it was screened with subtitles. It is the first film to be directed by Mullan, 50, since 2002's The Magdalene Sisters. That film won a Golden Lion at the Venice Film Festival. Mullan, who grew up in Glasgow, also won the best actor award at Cannes in 1998 for My Name is Joe. He made his name acting in films including Shallow Grave, Trainspotting and Braveheart, and plays John McGill's menacing father in Neds. He will also be seen playing the Death Eater Yaxley in the last two Harry Potter films. The Spanish film festival gave its best director trophy to Franco-Chilean film-maker Raoul Ruiz for his four-hour epic Misterios de Lisboa. Spain's Nora Navas was named best actress for her role in Pa Negre, a drama about the country's civil war.